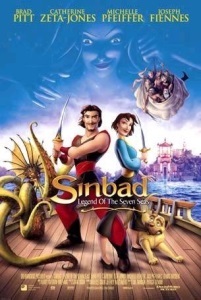 "Sinbad: Legend of the Seven Seas" plays like a fire sale in three departments of the genre store: Vaguely Ancient Greek, Hollywood Swashbuckler and Modern Romance. That it works is because of the high-energy animation, some genuinely beautiful visual concepts and a story that's a little more sensuous than we expect in animation. "Sinbad: Legend of the Seven Seas" is another worthy entry in the recent renaissance of animation, and in the summer that has already given us "Finding Nemo," it's a reminder that animation is the most liberating of movie genres, freed of gravity, plausibility, and even the matters of lighting and focus. There is no way that Syracuse could exist outside animation, and as we watch it, we are sailing over the edge of the human imagination.